Burgas (a prime area) is one of Bulgaria’s most developed regions. Droves of visitors come to relax on its golden beaches, explore its seaside villages, and take in its vibrant night scene. The province also has numerous thermal springs. Burgas has beautiful forests, with the Dyavolska and Fakiiska rivers running through it. The Strandzha and Sakar mountains, with their diverse wildlife, are popular ecotourism destinations. National parks, hunting and wildlife reserves abound. Burgas has always been known for its wines, among which Sungurlare is quite famous. The Stradzha Mountain is dotted with ancient dolmens, among the world’s oldest man-made structures. There are Thracian mounds, remains of Greek poleis, and the ruins of medieval fortresses all over the region. The seaside village has quaint cobblestone streets that lead you to medieval churches with ornate façades and colourful floral gardens, as well as homes from the National Revival Period. For all its natural beauty, Burgas is also an industrial region. Oil and coal are two of its biggest products, and its sea port (in the capital, Burgas City) is the largest one in Bulgaria. The regional capital is a modern, bustling city on the Black Sea. It has a developing tourist economy, as well as a busy trade atmosphere. Although it’s quite well developed, the vibe in Burgas isn’t as hectic as in some other centres. Its port is the largest in Bulgaria. Locals are laid-back, and the relaxed city atmosphere is punctuated by good shopping areas, great restaurants and numerous cozy outdoor cafés. Seaside villages with fine sands are close by. There are also some beaches in the city, the best being the ones below the Sea Garden Park. The Sea Garden Park is a small, restful park cradled on a high shore. Its humble, tree-lined lanes lead to colourgful flowerbeds, a zoo, and an open-air theatre. Burgas is a good base from which to explore the Black Sea coastal resorts, as well as the seaside village of Duni, with its Bulgarian Renaissance architecture. 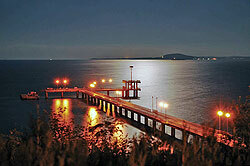 Both an ancient city and a modern resort town, Pomorie overlooks the Black Sea atop a narrow peninsula in Burgas Bay. On its other side, Pomorie is bordered by the ultrasaline Lake Pomorie, a protected lagoon and wetlands that has been promoted as a potential ecotourism hotspot. It has long been recognized as one of the prime bird-watching sites in Europe. A centre has also been built near the lake for spa lovers who want mud treatments. As a visitors’ attraction, however, the lake comes second to another body of water: Pomorie Bay, where yachts sail and fishermen fish and bathers enjoy the area’s generally pleasant weather. There are several luxury apartments with striking sea views in Pomorie for the well-off who visit its spas, resorts, and black sand beach. On any given day, dozens of beach umbrellas are open over the sandy stretch of Nessebar’s shore, sheltering hundreds of beachgoers from the sun. Nessebar is one of the top tourist destinations in Bulgaria, and it’s quite convenient that Burgas’ international airport is only a few kilometres away. 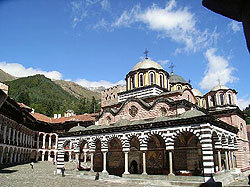 The town is not short of tourist attractions either, with its Roman ruins and Byzantine churches. The cobblestoned streets and small handicrafts stores in Nessebar’s old quarter receive a lot of visitors winding down after a day at the beach. Bulgaria’s biggest resort complex, Sunny Beach (Slunchev Bryag), is situated in a wide bay facing the sea not far from Nessebar. Sunny Beach has about 100 hotels and a similar number of restaurants and is the biggest complex of its kind along the Black Sea coast. The nearby village of Irakli has its own beach. Once a protected zone, the beach is also being developed into a resort and is quite popular with families. A forest stands not far from the shore. A new and ambitious seaside development is being built in the small village of Medovo: a luxury resort that will join the ones that are already on nearby Aheloy Beach. There are also several mineral springs in Medovo. Like any small village, Medovo has a school, some good shops, a community centre, a restaurant and a library. A new golf course is being built not far from the area.